Today is the first day of Rosh Hashanah (Jewish New Year) While I can not have my world famous apple cake, please do have a slice for me. Grease and flour a 9 inch Bundt pan. in the eggs until light, then stir in the honey and vanilla. moistened. Fold in the apples and nuts. until a toothpick inserted into the crown comes out clean. and tapping out of the pan. I hibernated a lot, but I got a good amount of stuff done too. 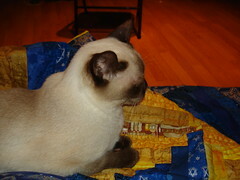 I then sewed down the binding on the minky blanket. Check that off of the list! Still in the mood, I pulled all of my train novelties & some other stuff to make it big enough & made the backing for the RR X-ing quilt - I can check that off of my list of things to do before Thanksgiving! Saturday we trekked down to Virginia (If you live in this area you are aware that you need you passport to cross the American Legion Bridge...) to get some Rx from the vet & to do some grocery shopping. We really like the grocery store in Virginia that is near the vet's office... That may be weird, but there you have it. 4 hours later we went home. Nothing crafty went on, I cooked the fish - so that we could have Nicoise salad for dinner & easily portioned pieces of protein for the diet. (Those fish mongers were not happy to hear, "I want 3 oz. pieces.") I also boiled a heck of a lot of eggs. Tiny type mean that I am 100% done - & that I do not know how to strike through the text. 1. ALQS2 - no photo, so it can remain a suprise. I need to audition borders, baste, quilt, & bind it. Now I just need bind it. 2. RR (x 3 or 4) I am not sure how many more rounds we have, but I am doing the quilting on the current one.I am about 90% done with the quilting. Done with the quilting round. 5. Hand Quilting the blue & yellow log cabinProbably 80% done on this - since I need to mail my other quilting, I set this aside. 8. Bind the baby quilt after it gets quilted by the long armer... (Instead of adding it to the pile of quilts that need the binding finished. )At leat 75% done with this one! Why this one bothers me more than most, I can't say. Maybe it is the way that he shunned Hollywood - stayed "normal." Maybe it was all of his liberal causes. Maybe it was his spaghetti Sauces that I like more than 90% of the homemade sauces that I have tried - in Italy as well as abroad. I'm not really sure... But I know that he will be missed. That is just what I did! By the time I got my first row of stitches done, I immediately felt better. Oh & the cottage cheese mixed with apple sauces isn't tooooooo bad as far as my new diet goes. So if you have a small portable project & a job with a lunch hour - give it a try. Quilting really is therapy. 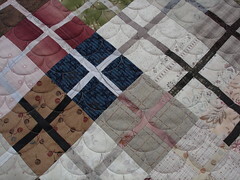 Back to the quilt, I chose it because it is one of the most popular on flickr. 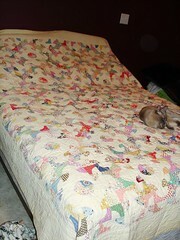 It is pretty close to 2 years old & it is the quilt that I am currently using on my bed. (That was coincidence - I was making my choice based upon flickr popularity.) 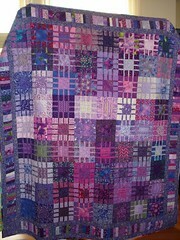 This is the kind of quilt that i really enjoy making - use every purple (insert color) and go for it! Some low contrast, some high contrast, some dark, some light, some "does that go?" With the purple color - some reddish purple, some blueish purple! Does any one else do monochromatic quilts? We all experience changes in our lives. We have to reign in the budget because the gas prices are on the rise, we move with jobs, we grow old, we get sick, etc. "Hello, my name is Amy & I am a cat-a-holic." "Hello, My name is Amy & I am an egg-a-holic." I got a bean soup mix - the doctor said that more beans in my diet would be a good thing. Last night I finished (I hope/think) the "part A" sewing on the faux log cabin. Now I can work on piecing a back without guilt. Anyone know what those balls are called? Add the roasted garlic by squeezing it out of the papery shells - after it has cooled a bit. Stir, add seasoning to suit your taste - I always add freshly cracked black pepper. Once the soup is hot & the flavors have blended nicely, add the spinach (I use enough for the number of servings I need - about 1 handful per person) stir until wilted, serve immediately. I find that this is fine for leftovers if the spinach is not left in the soup - hence the "use enough for the number of servings" note. Especially when the US is ranted 29th in the world in Science? Especially when we need a good science base to be able to learn new ways to use renewable energy sources? To find cures for Alzheimers, Multiple Sclerosis, Leukemia, etc. To be able to handle our trash/recycling better?ETC.! I know that there are a lot of Jews who believe/live/teach that what is said in the Torah is "it." Not open for discussion, but they are teaching their kids in religious schools, where they can control the education. They are not advocating (that I know about) that this is taught in public schools. Isn't creationism a religious belief? Don't we have the protection of "Separation of Church & State?" Isn't this why churches have schools? That is at least part of the reason why Synogogues have schools (they also want Kosher meals/snacks, etc.). To begin I am still having fun & I rather like having a list to keep me centered. 1. ALQS2 - no photo, so it can remain a suprise. I need to audition borders, baste, quilt, & bind it. Now I just need to quilt & bind it. 2. RR (x 3 or 4) I am not sure how many more rounds we have, but I am doing the quilting on the current one. I am about 90% done with the quilting. 3. 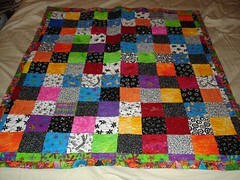 RR X-ing quilt - I want to piece the top & the back & ship it off to a long armer. Probably 80% done on this - since I need to mail my other quilting, I set this aside. At leat 75% done with this one! All of this should be done by Thanksgiving (November 27, 2008). No stress - still fun. Well, now I don't have the excuse of "I want to have everything in the bag for my appointment on Friday." A bit of a weekend wrap-up. A bit of a "what's the status on that?" A bit of "junk in my mind." I guess I will try to go chronologically. On Friday I had the GTT. While waiting for the 3 hours to elapse, I quilted on my round robin quilt. I broke through my callus... I went to IHOP for "make me feel better" dinner - aka breakfast. I only 1 bruise out of 4 needles! YIPPEE! That gave me the impetus to get out of the house - it was such a lovely day & I wanted to get some cheddar cheese & a treat for sew-n-tell. So I am at Joannes & I see the fabric - I purchased it at least 2 years ago. 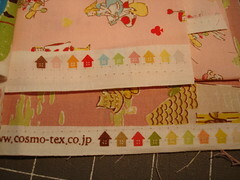 But I also saw some star fabric (much more useful) that I would not mind purchasing. I went into sticker shock! Almost $11 at Joannes... I passed it up, but decided to look around (I am back into an I SPY kick.) I found a few things & then wandered over to Trader Joes for some cheese, cake & other food stuffs. Mission accomplished. You could almost see the big check mark above my head. On Sunday, I went into the office for a bit... I got what I think is our last CSA share... (Same stuff different week, husband is going to look for a different CSA for next year. 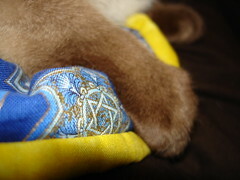 He is also going to verify the ending date - he thought that we got shares until October.) Then I went to sew-n-tell. I shared & passed off our most recent group project = YAY! 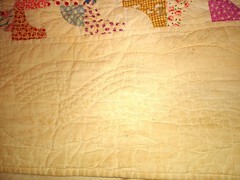 I got 3/4 of the binding finished on the baby's quilt that I shared last week. While working on it, one of the gal's asked, "Who is that for?" I replied, "You might not have noticed, but I am expecting. This is for the baby." Later she said that I have too many quilts. Pish Posh! I also shared the internet round robin that I am working on... I am still so amazed that some people get one idea of a round robin & can not fathom the idea of another way of doing them. Some of the gals were quite shocked that the quilts that we are doing are a. so small & b. will be finished when the cycle is over. That reminds me, I have no concept of how long it takes to do "anything!" I sit around thinking that it takes X-hours to do Y - when in faxt it takes X+Z hours to do Y. Case in point, 9 times out of 10 I miscalculate how long it takes to get to Baltimore from where I live... 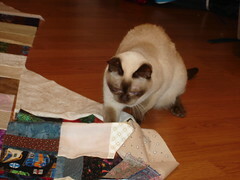 I am especially bad when it comes to estimating the amount of time it takes to do anything quilty. For example, I brought 2 doll quilts to quilt to my 3 hour appointment. I got about 90% of one done... I took the baby quilt to bind to sew-n-tell, I only got 3/4 done - but I had my pre-cut I SPY charms in that bag as well, thinking that I would be able to sort out duplicates. Oh & I have issues with quilt math. You see in addition to 2 I SPY quilts where I have a pattern to follow, I kind of want to do another (I really should finish one of those... before planning yet another.) but this "new" one is supposed to focus on 5 specific letters - I am thinking a 50x50 layout - so the squares would roughly be 10 inches, but a lot of my fabrics are pre-cut to 5 inches & 3.5 inches (For patterns that are far easier to follow.) & If the "I" image is small-ish, it would get lost in a 10 inch charm... So I am envisioning a 1, 4, 9* layout. *1 patch, 4 patch, 9-patch - all ending up the same finished size so that they can all be in 1 quilt. Finally, I have to tell a cat story (or 2). On Sunday after getting my CSA, I went home to drop them off, my girl cat scampered up to say hello to her mommy - my boy barely lifted his head. When I got to the bathroom - the boy usually follows... When I take me shower, he has a towel to sit on... The girl occasionally joins in on the fun. This morning, she hopped up real quick & made herself comfy on the towel. When RB got up there he looked around as if to say, "Aren't you going to make room for me." He finally scootted onto the towel. When I finished my shower it was so apparent that she was comfy that you could see the pink of her toepads. :o) He just continued to sit & look as if to say, "This is so not fair." Now, that is all that is fit to post! 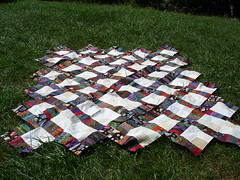 I can show you my scrappy quilts all day! This one is now in the nursery awaiting my prescious arrival. 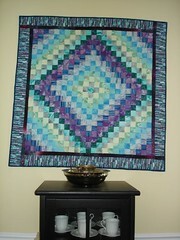 Thanks for all of the lovely comments on the Isotaupe quilt yesterday. It is a personal favorite of mine. On Thursday evenings, we have our child birth class - so no sewing for me yesterday, but today I hope is a completely different story since I will be at the Lab for 3 hours. The back is a big piece of one of those small pieces from the front. It was so hard to bite the bullet and do that, but my husband got the yardage & at a discount as compared to Pinwheels - my regular purveyor of taupes. I almost forgot, those blocks are placed randomly. (I don't use a design wall.) If I did, I would have moved some of these around a bit, but I am sure that if I got to that point, that it might not get off the design wall! I am also in love with the letters that are being created on this blog. She had me at "b", the first letter that she did. Not only do I like appliqued letters & pieced letters (Still need to try my hand at free pieced letters) but I like fabric that has letters on it. I also want to do an I Spy based on a word - using the letters & images that correspond to those letters! How often do you search? Do you look at their stuff first? Do you only look at their stuff? What is your current favorite flickr photo? Do you use webshots instead? Why? Any other quilt photo/inspiration sources that I "need" to know about? 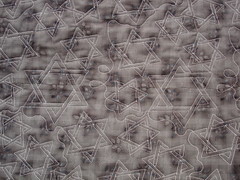 Michael 5000 was suprised that I found an image of his quilt... So that is why I am pondering this subject and asking the questions. I finished piecing the RR X-ing top. You don't look too hard & I won't point out the "errors." I had quite a bit of help from my helper who is usually to "big" to be bothered. No one can tell me that that is not CUTE! So that is how I spent Saturday. 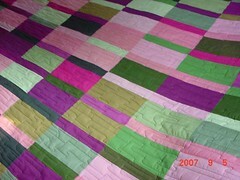 Also on my list is a gift quilt for a friend - I worked on that yesterday. YAY - I have been putting that off for FAR to long! I hope on that to get more done tonight. It is a faux log cabin - I have had the su-b cuts done forever, now I am sewing them into blocks - minus the single solid strips - I must have forgot to do those back when I was cutting for this project. Easy enough of a fix. I mentioned earlier that we got Acorn Squash in our CSA. I can admit it, I like squash. So does one of my favorite fabric designers. Here is her recipe. My husband did the cut in half & bake forever version - which wasn't all bad as we needed to reheat our chicken as well. Two recipes - one oven cycle. 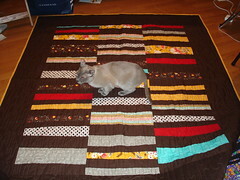 Mr. Monkeysuit is doing Simple & Dense for quilt month... Here is my take on that subject. 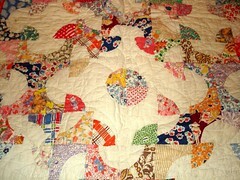 A. of all of the quilts that I love & flickr & there are a ton! I like the ones that could easily be classified as Simple. Log cabins that don't care about value. The use of solids - especially white. Coin quilts. 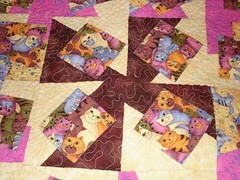 Quilts that are mostly 1 piece of fabric with simple appliques or piecing as accents. What have I done that I think fits this theme? I think that Plain Spoken (Pattern by Ringle & Kerr) fits this theme to a "T"
Thanks for all the Ike related well wishes. My father fared rather well. He was in an area that was told not to evacuate, so they moved his 92 year old mother in law in with them until normalcy resumes. 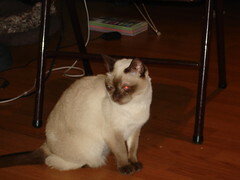 (one less senior for the home to deal with.) Over all they fared well, getting to the potty in the pitch dark was the hardest part from what I hear. No news on how the dogs took too it, but with enough "chicky" I am sure they were fine. CSA - peaches, apples, pears, acorn squash, tomatoes (off the top of my head...) I did not take any of the parsnips (I only use those in soup & we are not having soup weather!) or bell peppers. I'll post my weekend sewing in a few. Now I need to read what you all have been up to! This class was taught at a sew-n-vac shop that also sold fabric. 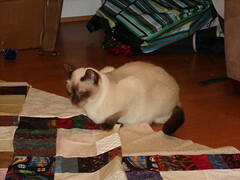 I bought all of my fabrics at that shop for this quilt - with a good amount of help. I still messed this up a couple times before getting it right. 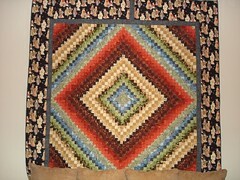 I showed this at a quilt guild quilt show, someone offerered to purchase it, but I never followed up on that. 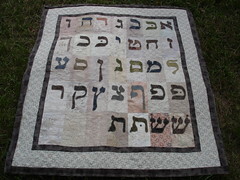 Which is probably a good think since this quilt was hung as wall art in the first condo that I "owned." using the same technique. I put these fabrics together & was going for an underwater look. I was going to applique fishies on to it - but after all of the work that went into piecing it, I trashed that idea. The fish are on the back. 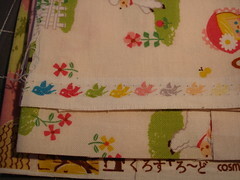 That border - is a single piece of fabric that I found AFTER I pieced the quilt. 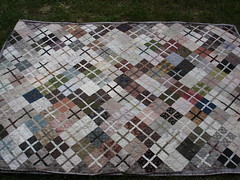 it is so perfect for this quilt, from a distance it looks like scraps. The quilt hangs in my dining room. 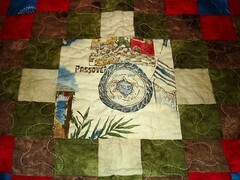 Since this is turning into a Trip Around the World Lovefest, I made this one using the strip piecing method. Can I make it to November? Since I am going to boil down to one issue, can I survive past November if the other side "wins?" 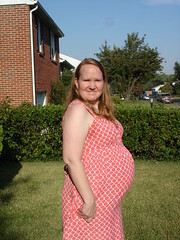 Why when I am 28 weeks pregnant am I stuck thinking/reacting to all things political? Am I seeing beyond myself into the future? First & foremost, thanks to all of you with the wonderful tips for my delicate situation. 3. I am on colace/stool softener. Last night, I ironed the fabric that will be the setting triangles in the RR X-ing quilt! (On my list!) 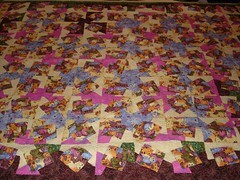 & I basted the doll quilt - also on my list! here it is: Halloween swap. If that wasn't bad enough, I shop at CVS & that is where I buy Preparation H. I just got a frequent shopper coupon for Preparation H - YAY ME. Are there any other lovely symptoms for me to look forward too? 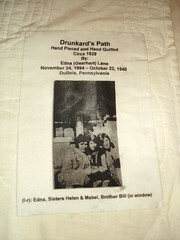 This Drunkard's Path Quilt was hand pieced and hand quilted by my great-grand mother. O.k. so the kitten is kicking - right now. I am so not sure how I "feel" about it. I love Fall & Winter & Spring - pretty much any weather when it is o.k. to have hot soup & to curl up into a quilt. Summer - for a red head - not so much... Heat that drives you into the AC - not so much... Heat that makes your heat seeking cats seem too hot - not so much... Lucky for them we are able to live a fairly climate controlled life. I promised a cat filled quilt post so here goes. Caveat: My weekend begins on Friday afternoon when I get off work. 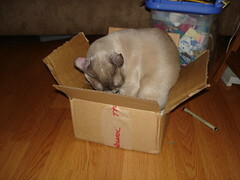 In the box was a gift for the Kitten from a lovely blogger who does not blog near enough, ahem. Thanks again. "I know I can fit." I occasionally get inspired - you should see my piles of recipes... But I watch them because I don't have to pay attention while quilting. Those stitches are not going to win me any awards, but the quilt is nearing completion. 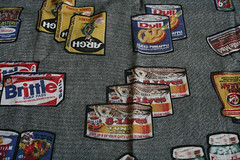 I also need to work on some other quilty projects in the "now" time frame. Aren't her cat fingers too cute for words? 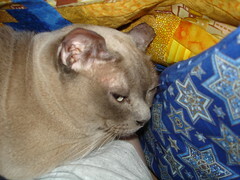 Before I got this shot, RB was under the quilt - which was moved a lot... One time there was an "opening" and Rhapsody peeked in to see him - I thought that that was cute - because she usually just attacks the lump. She swatted him, that was not so cute. CSA - pretty much more of the same. No zucchini this week hence the spice cake. 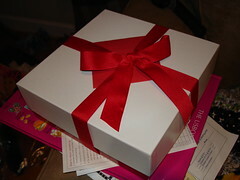 :o) I had "Birthday cake for dinner last night." When I mentioned that to the hubby, he said, "Who's birthday?" I said, "I don't know but with cake & ice cream, it is bound to be someone's birthday." Mr. Calico Cat went to a sports bar to see "Farve & The Brett's" play football... Yes, that still is funny! They won, so it is all good. He is going to Philly for a work related meeting for a few days this week. I need to plan some good stuff to do! Maybe I can finally go see the new Indiana Jones movie, or any number of other movies that I have wanted to see... I might go out to eat Mexican/Latin American food... I would say, "I am going to quilt." But I do that already with him around. That must be all that is fit to type (minus all of the political stuff running around in my brain) for now. Mr. Monkeysuit blogged about quilt books recently. So I will sorta follow suit. 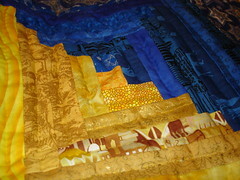 When I started quilting I would have said the 3 books by Ursula Reikes. Not too long afterwards - the cat book(s) by Janet Kime. The triangle based books by Sara Nephew is probably still on my list. 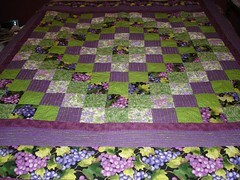 I went through the Nickel Quilts phase (Author Pat Speth). I went through the Baltimore Album Phase - mostly Mimi Dietrich, with a healthy does of Elly "I have no idea how to spell her last name." I really like both of the books that I have by Weeks Ringle & Bill Kerr. I am completly entranced by Denise Schmidt - but intimidated by her method; hence the enlarged patterns & bundles of fabric waiting to become quilt tops. I have many other quilt books & fairly regularly look through many of them "again." What quilt books can you not live without? Heck, I am celebrating that I could post it ('puter problems)... Thanks OklaCookiemaker. & as my grandmother says, "Skip the recipe, send me the cookies." She used to send out cookies & while watching FoodTV this past weekend, I saw a show with nostalgic recipes & Boy oh Boy did I get a hankering for Raisin Cookies (I have the recipe, but the "add flour until stiff" part has NEVER worked for me.) So I made a spice cake - Thanks Betty - adding water, eggs & oil was all I could muster & you knew it. Waxing Political (Not really, just checking to see if you are still awake. I keep that stuff off-blog or in blog comments.) It felt good to type it - but I deleted it. I don't care how you feel about Candidate A, B, or why oh why can't we have a "C." I figure that you are here for the other stuff that I ramble about. 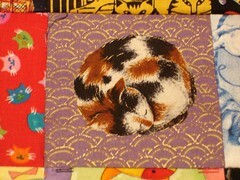 And in that spirit my next post will be a Cat covered Quilty one! If you were not participating in the "fungly challenge" and an innocent commentor asked "Is that you fungly?" Would you be offended? Oh & a fungly is not on my list of things to finish by Thanksgiving... But I really like to see those wild combinations & to see people using their less than loved fabric! As Bonnie would quip, "I paid for it." 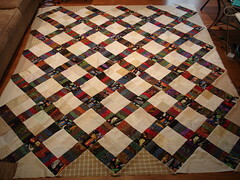 The actual quilt is a lot bigger than this bit (this might be 1/4) & some of the piecing is far from perfect. 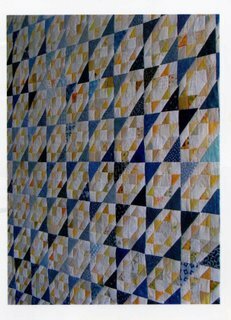 I had tried to piece & quilt before this, but those examples are so far gone that they should not even be mentioned. I ruined a not so great top by trying to quilt it myself on my sewing machine. Then I found out about long arm quilters. 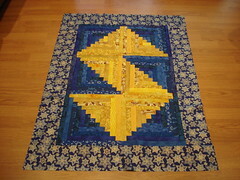 The blue & yellow stars was quilted by a long armer. The binding - is the wrap the back around to the front type of binding - not the best, but this quilt is not "used" so that method has served this quilt well so far. Wow - what a wordy title. Expanation 3, The baby is due in early December, so me sewing in December does not sound like something that I can "plan on." Therefore, I would like to finish these projects by Thanksgiving - Thursday November 27, 2009. I did not go to the Harrisburg, Pa. quilt show. I did not go to the Md. State fair. I did pick up my CSA - same stuff different week. I did go into work for a few hours - so that today would not be super hectic. I did go to a minor league baseball game - for a while. I did pick up provisions at a big box store that shall remain nameless. 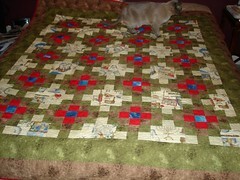 I did not trim scraps - for the very long term postage stamp quilt or for the Chinese Coins quilt. I did cut strips for the blue & yellow log cabin - twice. I did finish piecing the blue & yellow log cabin. I did baste the blue & yellow log cabin. 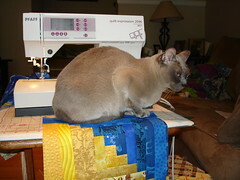 I did get a lot of help from my big kitty helper. I did layout the RR X-ing rows & fixed an oops. I did not cut the setting triangles for the RR X-ing quilt. 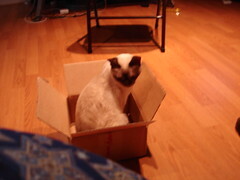 Rhapsody, "You didn't want me to actually 'help' you?" "I'll just wait to sit on your lap." The Blue & Yellow log cabin top. I was going to use a different fabric for the border - yellow stars instead of the light blue stars - but it looked super blotchy. I was also going to add a narrow inner border of yellow - but I like how the final blue row in the log cabin blocks make a scrappy inner border... 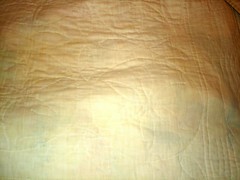 I am using yellow for the binding. This quilt came completely out of my stash. However, this is not one of those "stash quilts" where I purchased the fabric for "X" quilt, but did not get around to piecing it until way later... I am very guilty of that. My general idea of a "stash" quilt means that I did not buy a kit or run to the store that week to get the fabrics for this quilt.